So, do y'all want to hear a funny story about me? Okay, here it goes. Growing up, I RARELY ate anything out of a can or box. I was lucky in the sense that my parents were AMAZING cooks and made meals from scratch every night. That being said, I never got to try things like Shake and Bake. I would see commercials for it and I would want to try it so bad. I don't know why, I was a nerdy kid that just did. Anyway, when I moved out at 19, one of the FIRST things I did was make pork chops with shake and bake. Needless to say I was a little disappointed. However, I LOVE the idea and simplicity of it. 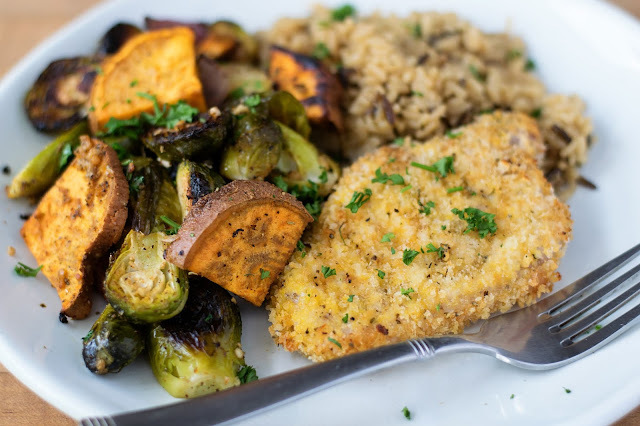 That's why, when thinking of one-pot dinners and sheet pan meals I wanted to take a "shake and bake" approach to my Crispy Pork Chop Sheet Pan Meal Recipe. To begin you'll need to preheat your oven to 425 degrees. Next, you'll need to place all of your vegetables into a large bowl. and a 1/2 tsp each of the onion powder, garlic powder, Italian seasoning, and paprika. Also, you will add a 1/2 tsp each of salt and pepper. Give everything a nice toss with your hands until all the vegetables are coated in the garlic, oil, and spices. Then, place them in a single layer on a lined baking sheet. Now you will need 2 shallow dishes. In one you will add the eggs and remaining onion powder, garlic powder, salt, and pepper. In the other you will add the panko bread crumbs, Italian seasoning, and paprika. I also threw in a pinch of salt and pepper as well. Now you will dip the pork chop into the egg mixture on each side. After that, dip it into the bread crumbs on each side making sure they are well coated in the crumbs. Next place the crumb coated chops on top of the vegetables. Place into a 425 degree oven and bake for 15 minutes. After 15 minutes flip the chops and bake for 15 more. And there you have it! 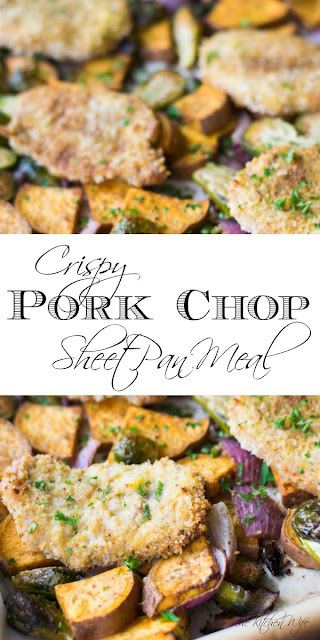 A beautiful, flavor pack Crispy Pork Chop Sheet Pan Meal that your entire family will love! I served it with some Uncle Ben's Ready Rice (not sponsored) and BAM dinner is on the table! 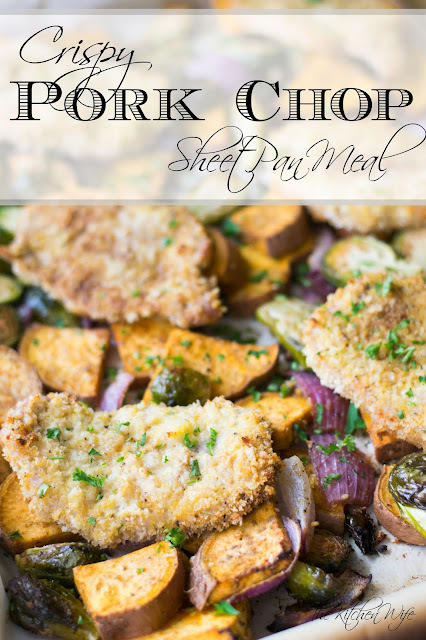 I know you're gonna love this Crispy Pork Chop Sheet Pan Meal so get in the kitchen and give it a try tonight! Place the vegetables in a large mixing bowl and add the garlic, oil, and 1/2 tsp each of salt, pepper, onion powder, garlic powder, Italian seasoning, and paprika. Give everything a toss so that it is coated in the spices and oil. Place the vegetables onto a line baking sheet in a single layer. You will now need two shallow dishes. In one add the eggs and remaining onion powder, garlic power, salt, and pepper. Lightly beat the eggs, mixing the spiced into them. In the second shallow dish you will add the pan bread crumbs along with the remaining paprika and Italian seasoning. I also add a little salt and pepper. Dip the pork chop into the egg mixture, coating both sides. Then dip each side into the bread crumbs making sure each side is coated. 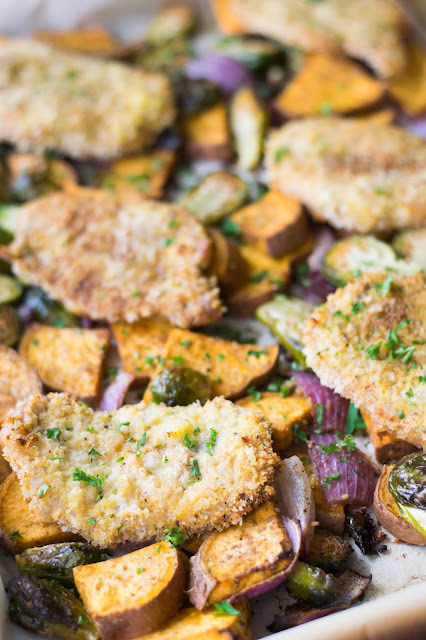 Place the breaded chops on top of the vegetables on the sheet pan. Place in the preheated oven and bake for 15 minutes. After 15 minutes flip the pork chops and bake for another 15 minutes.